Sorcerer is SPI’s first game of magic and fantasy. The 22” x 34” map depicts a multi-coloured land of sorcery. Each one-inch hex is coded with the colour of the magic most powerful in that location. There are seven hues of magic, in all, each of which is more powerful than the next! 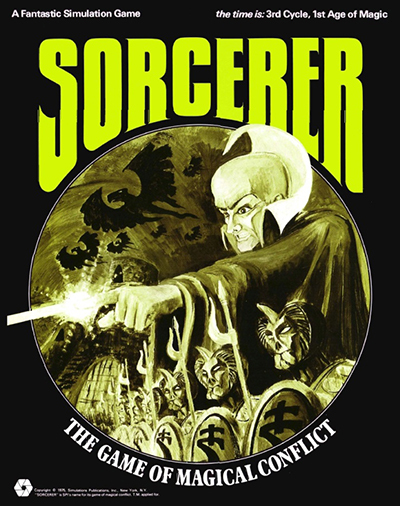 Sorcerers can perform many feats of magic: conjure magical units; … throw magic bolts; teleport themselves and their armies; change the colour of hexes; clone themselves into three Sorcerers; create the devastating Vortexes; and make themselves disappear. Which all sounds very cool and groovy, especially when confronted by the map which looks like 60s bathroom wallpaper on acid. In reality the game system was a confusing rock-paper-scissors affair along the lines of Green trumps Yellow trumps Purple trumps Red and so on and so on. Triumph in battle depended on which colour your demon was, the colour of the hex it was standing on, and the colour of the opponent. 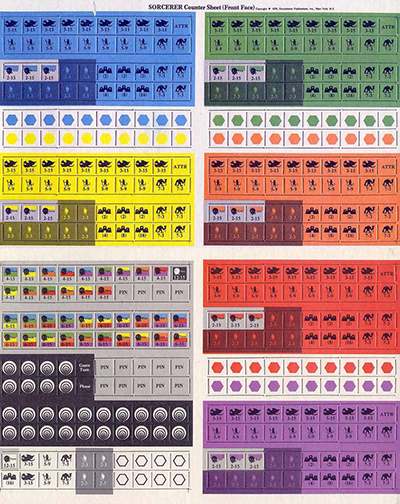 As an abstract system it was reasonably interesting – but the fantasy elements were largely chucked in as an afterthought – which was a disaster. Sorcerer exposed a basic flaw in early games of this nature – particularly around the concept of ‘chrome’ as opposed to a core system. 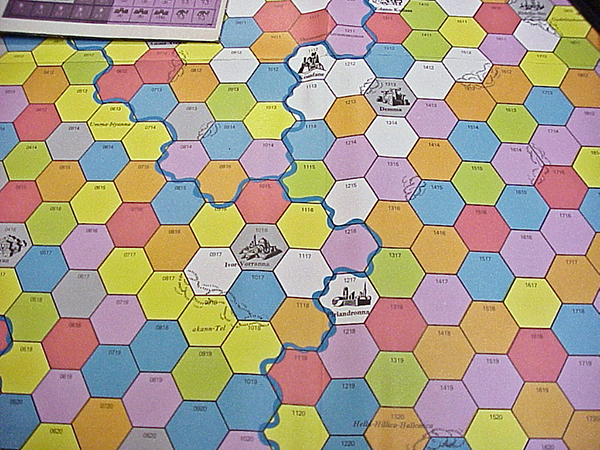 Most games that try and replicate events in the real or imaginary setting have a basic system – pieces move across a map, spending points for different kinds of terrain, until they encounter an enemy piece at which point relative strengths are totted up and compared, with a dice roll introducing a bit of randomness. This system formed the basis of hundreds of SPI games, covering events from ancient times to World War II. ‘Chrome’, on the other hand, refers to the historical details that make each game unique and interesting. Now if you’re playing a game about Waterloo you actually don’t need a lot of chrome to flesh out the simulation in your head. If you are a Napoleonic geek and someone shows you a cardboard piece that says ‘Old Guard’ your knowledge and imagination comes up with images of grumpy veterans in bearskin hats standing in a muddy Belgian field and shouting ‘Merde!’ at Sean Bean. In fantasy games, and a lesser extent, science fiction ones, you don’t have this real-world detail to draw on, and so you’re dependent on the designer to create a rich enough setting to make the simulation immersive. So with fantasy games, especially those in a non-standard (i.e. not Tolkien-style High Fantasy) setting, detailed chrome becomes the most important part, because without it the players have no frame of reference. With Sorcerer this was a great shame, because the designer Redmond A. Simonsen had eschewed the familiar orcs and elves clichés and opted for a more Moorcock-esque Multiverse setting with demon armies and mad wizards. There was potential here for a wonderfully baroque semi-roleplaying epic but instead the stories behind the sorcerers and their quarrels was tacked on as tongue-in-cheek but ultimately dull snippets of backstory to each of the scenarios. This lack of engaging content was compounded by the fact that the map had no distinct areas to fight over – it was a migraine inducing chaos of brightly coloured blobs which your units hopped around on in a fairly aimless manner. Don’t get me wrong – Sorcerer could be a fun game to play, but it took a huge effort of imagination to see it as anything other than a complicated, and abstract, version of Rock-Paper-Scissors that someone had emptied a box of poster paint all over. True, it was perhaps the first attempt to create a serious fantasy board game and we should be more forgiving. But it’s worth pointing out that 1975 also saw the publication of Chaosium’s classic White Bear & Red Moon, which somehow managed to get everything right that Sorcerer got wrong. In Greg Stafford’s game chrome was everything – and a huge selection of characters and units, each with unique powers, gave the game such a compelling richness that it formed the basis of the Runequest RPG system and saw the game itself through several editions. An excellent review, and I suppose I agree, though the game holds a soft spot in my memory. Also, the counters were (and are) beautiful. I have to agree with the review. I think the game is more fun with multiple players. We house-rules in some extra features (like magical swamps and obelisks) to create additional points to fight over rather than just some widely scattered cities. Once you’ve grasped how the system works, it’s very easy to add additional features in. I absolutely loved this game back in the day!